Best Acoustic Rock Song of All Time Poll: "Hotel California" Vs. "Roundabout"
We're out to crown the most beloved Acoustic Rock Song of All Time and we need your help! Today "Hotel California" and "Roundabout" go head-to-head. Vote now! 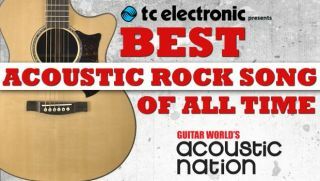 Best Acoustic Rock Song of All Time Poll: "More Than a Feeling" Vs. "Roundabout"
We out to crown the most beloved Acoustic Rock Song of All Time and we need your help! Today "More Than a Feeling" and "Roundabout" go head-to-head. Vote now!